From left to right: ARTBA Senior Vice Chairman Matt Cummings; P3 Project of the Year representatives John Patrick Walsh, federal affairs deputy director in the Florida Governor’s Office and Nuria Haltiwanger, CEO of ACS Infrastructure Development; and David Spector, director of the Colorado High Performance Transportation Enterprise, the P3 Entrepreneur of the Year. Florida’s I-595 Corridor Improvements Project and the director of the Colorado High Performance Transportation Enterprise (HPTE) are models of excellence in innovative transportation financing. 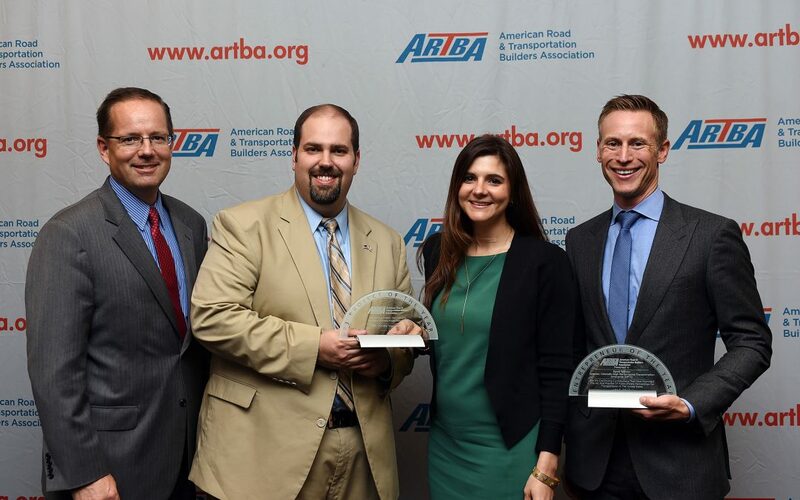 They were recognized at ARTBA’s 29th Annual Public Private Partnerships (P3s) in Transportation Conference, July 13 in the Nation’s Capital. P3 Entrepreneur of the Year: David Spector. The award is given to an individual who has made outstanding contributions to the forward progress of P3s in the U.S. transportation industry. The HPTE division of the Colorado Department of Transportation (CDOT) uses P3s, tolled managed lanes, and other innovative methods to finance and improve the state’s surface transportation infrastructure. As director, Spector has helped other state and local governments learn more about high-profile public-private infrastructure projects. He oversaw the completion of the U.S. 36 Express Lanes P3 project, which ARTBA named 2016 P3 Project of the Year, and is currently in the midst of procurement for the Central 70 Project. P3 Project of the Year: I-595 Corridor Improvements in Florida. The award spotlights a project that demonstrates the value that P3s bring to U.S. transportation development. I-595 is the state’s largest transportation project and also its first P3. I-595 is part of Florida’s Strategic Intermodal System, which serves the major east-west link in Broward County. Since its opening in 1989, it has endured a steady increase in traffic volume that led to congestion. Florida Department of Transportation (FDOT) and its team developed several improvements to help sustain the region’s growth, including reconstructing and widening the Turnpike, improvements and modifications to nine interchanges, and reversible express lanes that are tolled at varying rates throughout the day. The improvements were successfully completed on time while minimizing disruptions of the 200,000 vehicles traveling the corridor daily. The $1.8 billion deal reached financial close in March 2009, also making it the first in the U.S. transportation sector to use an availability payment compensation structure, helping to pave the way for future P3 projects in Florida and the U.S. The design, build, finance, operate, and maintain (DBFOM) project opened to traffic in March 2014 thanks to the project team of FDOT, RS&H, Nossaman LLP, Interstate 595 Express, Dragados USA, ACS Infrastructure Development, Inc., and AECOM.